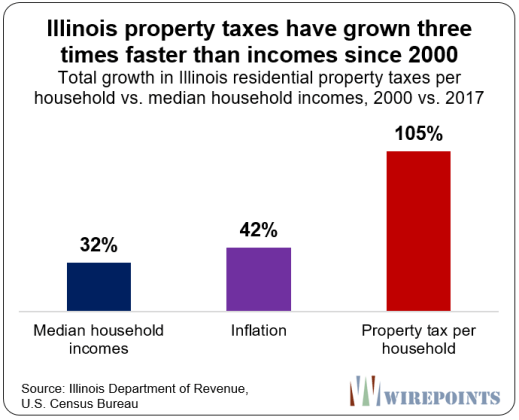 A lethal combination of rising property taxes and stagnant incomes has forced many Illinoisans to rethink their relationship with their state. More than 1.5 million net residents have already fled the state since 2000 – and you can’t blame others for thinking about joining them. Property taxes have become punitive in Illinois. We’ve written about how these taxes have destroyed the equity in people’s homes across the state. Many families have done the math, and whether they’re in the struggling south suburbs of Chicago or the affluent North Shore, they’ve decided to leave Illinois behind. The traditional method for measuring the burden of property taxes is to look at a household’s property tax bill and compare it to a home’s value. Under this method, Illinoisans pay the highest property taxes in the nation. At 2.7 percent, Illinoisans pay far more than residents in neighboring states – twice more than those in Missouri and three times more than residents in Indiana. That fact is outrageous on its own. 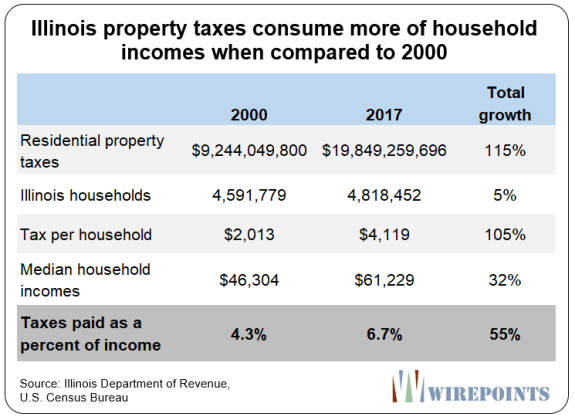 But to really understand the pain that these taxes inflict on Illinoisans, it’s important to compare property tax bills to household incomes. After all, those bills are paid straight from people’s earnings. The unfortunate reality is that Illinois incomes have been stagnant for years – and falling when you consider the impact of inflation. Between 2000 and 2017, Illinois median household incomes increased just 34 percent, far short of inflation. In contrast, household property tax bills are up 105 percent, according toIllinois Department of Revenue data. The net result: Property tax bills per household have grown three times faster than household incomes since 2000. 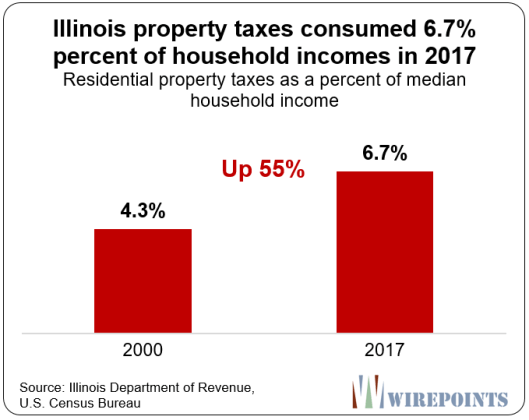 That means more of Illinoisans’ hard-earned incomes are going toward property taxes and less towards groceries, college tuition, and retirement savings. In 2017, 6.73 percent of household incomes went toward property taxes, up from 4.3 percent in 2000. That’s a 55 percent increase in the effective tax rate. 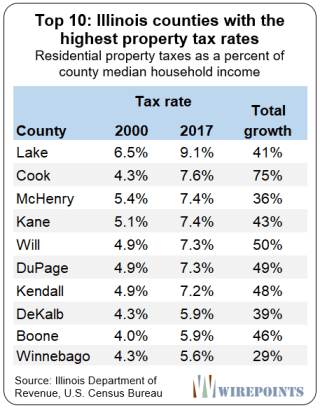 Residents of Lake County pay the highest property taxes in Illinois when measured as a percentage of household incomes. In 2000, Lake County residents paid 6.5 percent of their household incomes toward property taxes. Today, residents pay 9.1 percent. That’s a 40 percent increase. The average Lake County property tax bill is now over $7,500 per household.